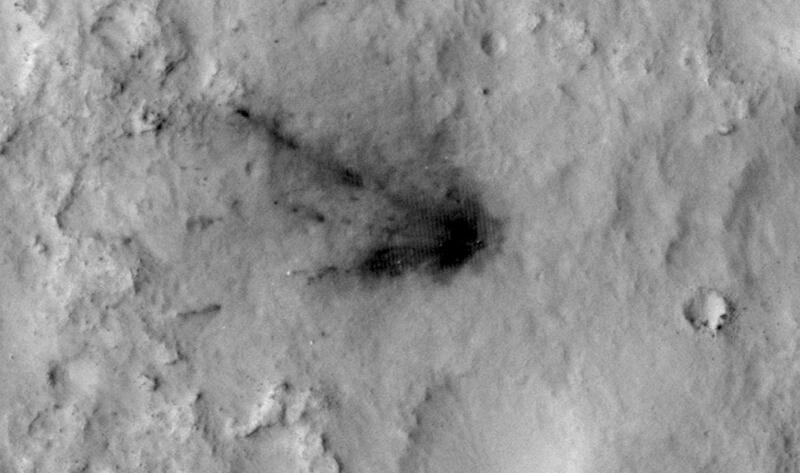 Spacecraft that land in dusty areas of Mars create dark blast zone patterns where bright dust is blown away by the landing. Monitoring with the High Resolution Imaging Science Experiment (HiRISE) camera on NASA's Mars Reconnaissance Orbiter shows these dark patterns fade over time in a surprising way. Four sequences of images span two-and-a-half years beginning in the week after the August 2012 landing of NASA's Curiosity Mars rover inside Gale Crater. The first series shows a repeating sequence of seven images of the scar where the Mars Science Laboratory's descent stage hit the ground. The descent stage, or "sky crane," had lowered Curiosity onto the ground and then flown approximately 2,100 feet (650 meters) away and impacted the ground. 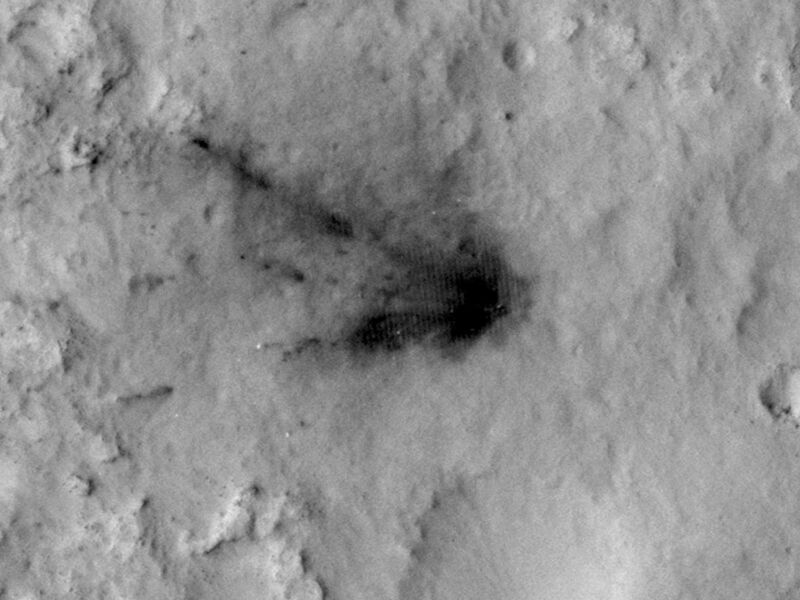 The fading of the dark blast zone resembles what has been observed at other Mars landing sites, presumably because bright dust is settling on the surface and masking the blast zones. Scientists thought they could model this fading and predict how long it would take for the patterns to disappear entirely. However, the most recent image, taken in February 2015, shows that this blast zone is not fading as quickly as expected, and may even be darkening. This indicates that understanding is still incomplete about processes that move dust around on the Martian surface. Figure 1 is a sequence showing the spacecraft's back shell and parachute. Wind causes changes in the shape of the parachute as well as fading of the dark zone visible around the back shell in initial frames. The Figure 2 sequence shows where the rover itself landed. Curiosity disappears after the first two of the seven frames because it drove away. Its wheel tracks heading generally east (toward the right) can be seen in subsequent frames, and they also fade over time. Figure 3 is a five-frame sequence of the location where the spacecraft's heat shield hit the ground. The images in these sequences have not been adjusted for differences in viewing angle or lighting conditions. Without such image processing, some features on the ground appear to shift slightly from frame to frame. The first image in each of the four sequences is from HiRISE observation ESP_028335_1755, taken on Aug. 12, 2012, six days after Curiosity's landing. A different product from this observation, mapping where various hardware hit the ground, is at pia16001. Additional image products from this observation are available at http://www.uahirise.org/ESP_028335_1755. Subsequent images in these sequences are from HiRISE observations ESP_028401_1755, on Aug. 17, 2012; ESP_030313_1755, on Jan. 13, 2013; ESP_034572_1755, on Dec. 11, 2013; ESP_036128_1755, from April 2014; ESP_037117_1755, from June 27, 2014; and ESP_036128_1755, from February 2015. The two observations in 2014 did not include the heat shield location. 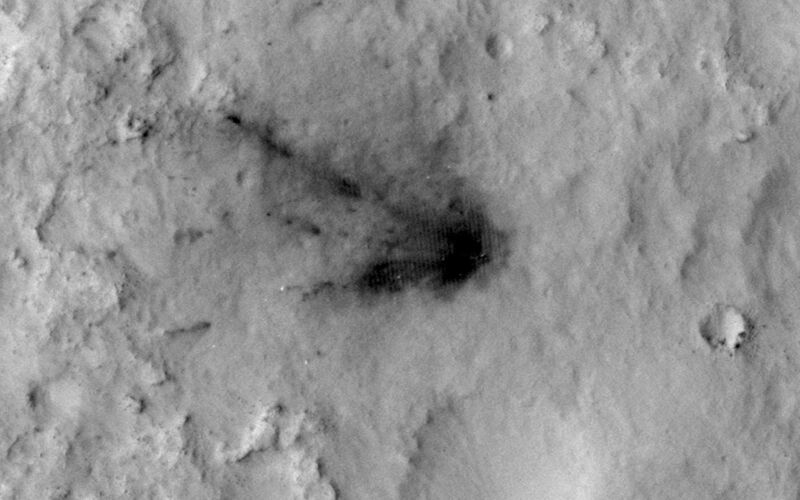 HiRISE is one of six instruments on NASA's Mars Reconnaissance Orbiter. The University of Arizona, Tucson, operates HiRISE, which was built by Ball Aerospace & Technologies Corp., Boulder, Colo. NASA's Jet Propulsion Laboratory, a division of the California Institute of Technology in Pasadena, manages the Mars Reconnaissance Orbiter Project for NASA's Science Mission Directorate, Washington.